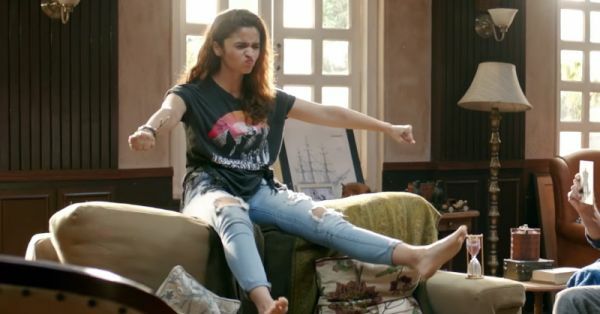 15 AWESOME Ripped Jeans For You - For Rs 1,500 Or Less! If there is one fashion item that has stood by us through all our fashion ruts, it is our forever loved jeans. With everyone going gaga over ripped jeans these days, it literally is the most basic and versatile item that one can have in their wardrobe. Distressed denims are SO comfortable and cool at the same time. So, we are here with 15 pairs of ripped jeans, all under Rs 1,500 that you will absolutely love! Thank us later, ladies! These sassy ripped jeans has our hearts. We love the printed detailing on the hemline. It looks so cool, right? Price: Rs 1,499. Buy it here. A pair of white jeans are a must have in every girl’s wardrobe. What’s even better are ripped white jeans! Pair it with pastels or white shirt for a white on white look. Price: Rs 1,019. Buy it here. This pair from Only is a must have in your wardrobe. The colour, fit and texture, everything is to die for! What are you waiting for, start shopping now! Price: Rs 1,147. Buy it here. Black is a super versatile colour and we can never have enough of it. So, these black jeans totally deserve a place on our list. A distressed pair of black denims will make you look stylish wherever you go! Price: Rs 899. Buy it here. 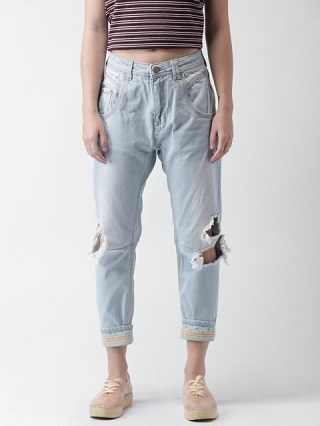 Get a direct entry into the cool club with these ripped boyfriend jeans. Pair them with basic tees and slip-ons for a comfy chic look or a dressy tank and high heels for a party-ready style. If you are a girl who prefers comfort mixed with style then you need to hop on board the boyfriend trend. 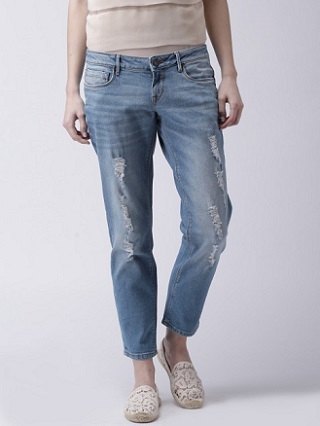 Trust these boyfriend jeans to make you look cool without compromising on your comfort even for a bit. It’s a wini-win! Price: Rs 1,119. Buy it here. Be a show-stopper in these distressed denims like it’s no big deal. Wear them with sneakers, a basic tee and a bomber jacket for a no-fuss look. Price: Rs 1,445. Buy it here. With celebs going crazy over the patchwork trend, these uber cool denims definitely need to be on your list. Look at those shiny patchwork stars, aren’t they just so cute? Price: Rs 1.499. Buy it here. 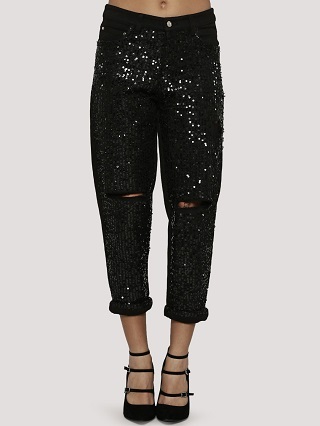 If you’re a girl who loves making a stylish statement and you want to stand out at a party without showing any skin, this sequinned piece is perfect for you. Pair it with a white shirt or a simple off shoulder top for a glamorous evening look. Price: Rs 1,102. Buy it here. 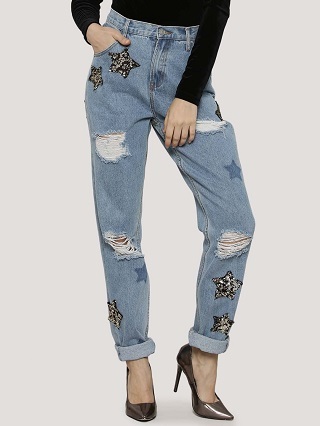 Look uber chic in this distressed pair of denims with patchwork details. Who said wearing jeans was boring? Price: Rs 1,359. Buy it here. 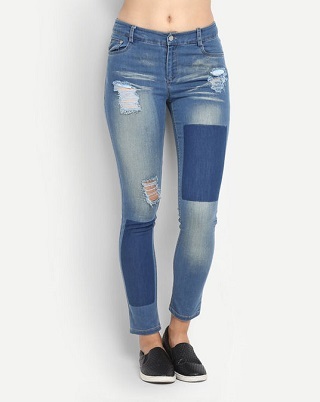 If you are a dark wash denim lover, these ripped-at-the-knee jeans should totally be in your closet We are absolutely loving it! Price: Rs 1,499. Buy it here. 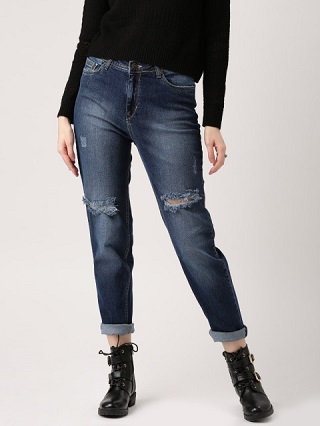 We dare you to find a pair of jeans as trendy as these ones at such an awesome price. This is a style steal at its best! Price: Rs 959. Buy it here. 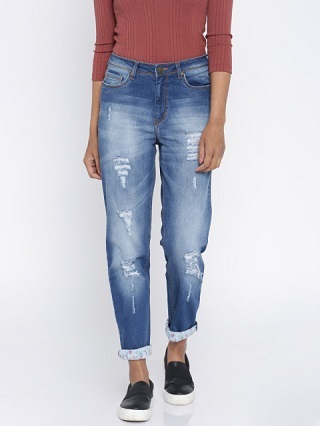 If you are new to the ripped jeans club, this is a great pair for you to begin with. It is really comfy and will make you look super sassy. Get ready to shine girl! Price: Rs 1,279. Buy it here. 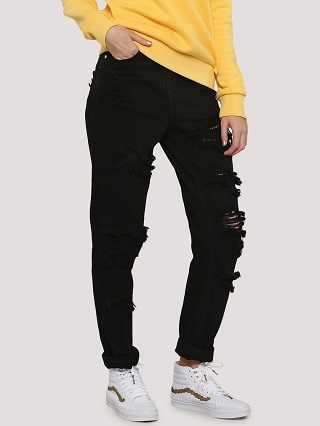 We are in love with these black ripped jeans. 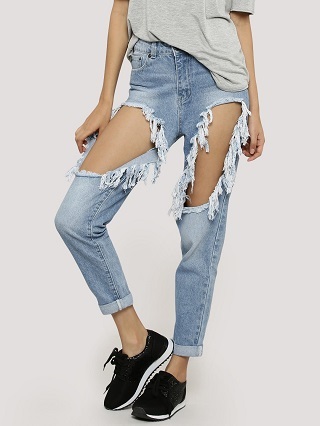 They’re super cool and feature mesh and ripped details on the knees. Just throw on a casual tee and a jacket and you’ll be good to go! Price: Rs 1,075. Buy it here. What’s better than combining two huge trend? 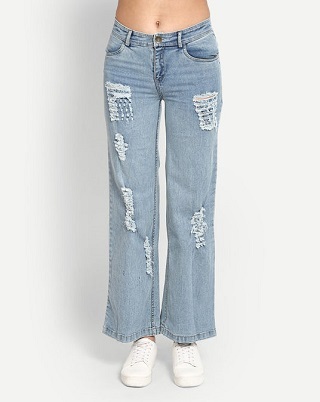 These flared ripped jeans are super cool and different. Trust us, you’ll be showered with compliments. Price: Rs 919. Buy it here. Start shopping now!